Those who have taught, or worked with 2016 OHHS graduate Taylor Helms know that she is a powerhouse of talent and one of the most hardworking artists in our community. Taylor created numerous sets for OHHS productions (and continues to come back to do so! ), designed a mural for Springmyer, and has racked up an impressive amount of art awards and recognition during her time in the district. Taylor has also had an epic run working as an ArtWorks apprentice. Over the past six years, Helms has participated in 10 different projects in the city with ArtWorks, including set paintings for the Cincinnati Children's Theater and the Cincinnati Ballet; ArtCars; "The Cincinnati Strongman: Henry Holtgrewe; "Mr. Dynamite", "Cincinnati Toy Heritage", "The Buzz Around Town", and "Emerge" murals. 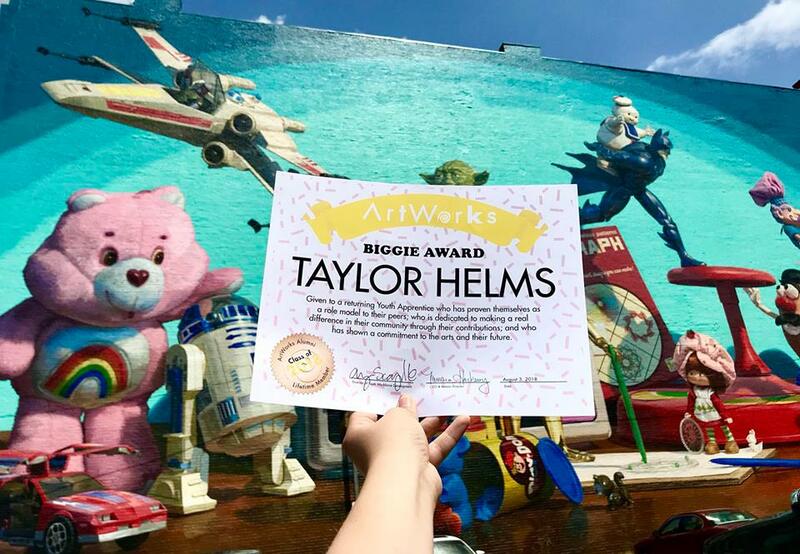 Taylor recently received the ArtWorks 'Biggie Award' in honor of her commitment to the arts, leadership skills, and serving as a role model for other ArtWorks apprentices. This summer also marked the last project for Taylor as an ArtWorks apprentice. Taylor will be embarking on new adventures during her summers as she starts to pursue other opportunities through the new Co-op program developed through the School of Art at U.C. 's College of D.A.A.P. Come out and show the support of her Highlander family to help Taylor celebrate the end of her ArtWorks era at her final mural dedication on October 17th. The dedication of the Woman's Art Club mural, "Emerge", will take place from 5-7 p.m. in downtown Cincinnati at 1200 Vine Street (enter from 12th Street).